Item: CVA 265-41 - "Creeper" is shown in position for erection of the top (and last) section of South tower. Taken from West Vancouver Ferry. Item: CVA 265-9 - 367 days after this picture was taken the "Empress of Japan" passed under the Lions Gate Bridge steel construction having been completed. Item: CVA 265-45 - 4:30 a.m. All is in readiness for scow and tugs to haul four catwalk cables across First Narrows. Light dim. Photo taken with f/2 lens wide open at 20 seconds. Item: CVA 265-46 - 4:50 a.m. Five minutes later the four catwalk cables were secured on North Shore. "Fispa" is near scow that is hauling cables across. Item: CVA 265-47 - 5:23 a.m. Three of the eight-ton cables for catwalks have been raised 325 feet above tide mark. Distance between piers is 1550 feet. Item: CVA 265-18 - A diver swings into position - lifted by derrick and wire rope. Diver's air-line is being paid out by man on top of bank. 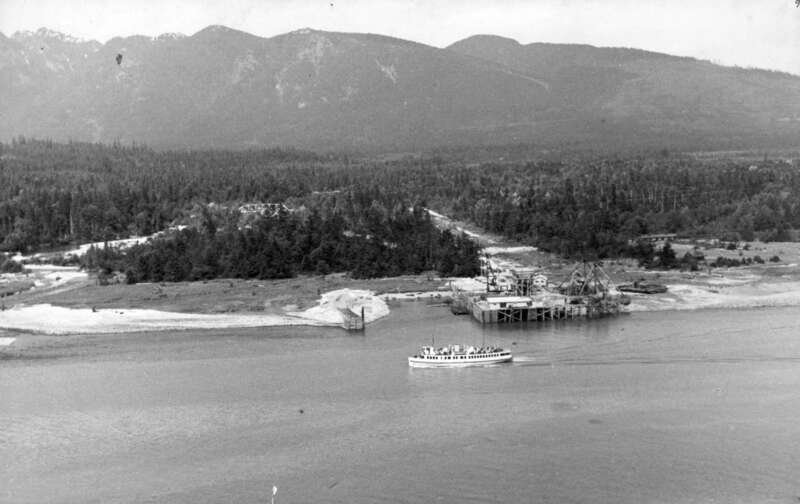 Item : CVA 265-9 - 367 days after this picture was taken the "Empress of Japan" passed under the Lions Gate Bridge steel construction having been completed. 367 days after this picture was taken the "Empress of Japan" passed under the Lions Gate Bridge steel construction having been completed.